« LOS ANGELES » : classification of the hardness of the stone	: first category, just below precious. The report Mr. Grogna, geologist of the quarry. 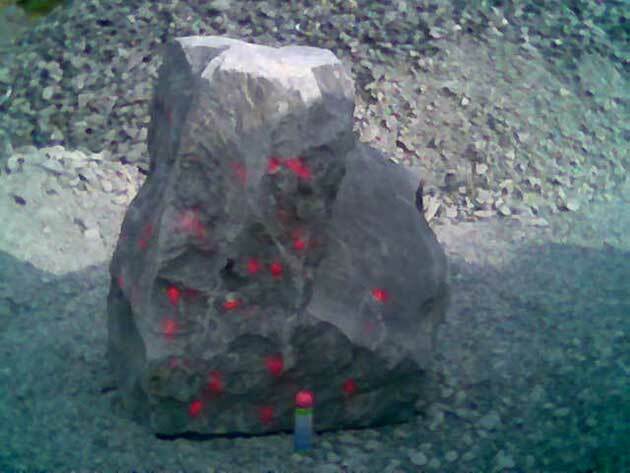 The analysis reports of the stone. The «Carrière sur les Roches» in Bastogne belongs to the Eifel Synclinorium. It exploits the Lower Devonian formations psammopélitiques. Rocks from the quarry are commonly called «progress». They consist of alternating beds of rocks pluricentimétriques to pluridécimétriques defined by experts as being according to the benches can be quartzophyllades zonaires, granules, or quartzitic argilisés sometimes with accompanying argilisés from tampering. Under other names, rocks can be defined as feldspathic or arkosic quartzite sometimes chlorotic psammitoquartzites of chloritized feldspar, of psammites zonaires, sometimes micropsammoschistes of feldspar. Tectonic structure is an anticline general direction NE-SW, accompanied by secondary folds. The longitudinal corrugations give it a character of complexity. Quarry is cut in the axial region of the fold. Wall in SE, DG flank is NE-SW and dip of 30 °. NW in the wall, the other side has a similar direction and dip of about 15 ° to N. The position of the banks is very variable in the fold hinge in the middle and secondary folds. However, it is pretty easy to follow the perimeter of the site. Facies is heterogeneous vertical. Laterally against it is homogeneous. The layers are generally regular. Minor irregularities are due to local buckling and some variations in the rates of sedimentation. Bench bench slides are rare and minor. Slight grinding affect the hinge zones of major folds and secondary without effect on the resistance crushed. The presence of the majority of fillings in fractures and spent most clay severely limits the permeability of the rock. Quarrying can produce a variety of high quality aggregates to meet the quality standards in force. These aggregates are for the local market, including near the Grand Duchy and are used in concrete, asphalt, ballast, foundations and foundation drainage in quality. Anecdotally, the scientific term «roving» adopted worldwide, has been defined in a career Bastogne during a geological excursion that took place here over a century. Belgian geologists have observed some crosscutting quartz mineralization rocky shoals at fairly regular intervals whose appearance resembles strands. After studying the phenomenon, they found that these quartz mineralization met in the relevant banks (banks hardness), while the other layers located directly above and below most incompetent (softer) No were unaffected. This is actually a very slow start tensile rocks (parallel to the surface of the benches) in an ancient tectonic phenomenon that has generated a series of fractures in appropriate levels, while the neighboring layers more incompetent willing to s stretch without breaking (creep phenomenon). The area of the fracture could be filled with milky quartz whose color characteristic very particular slice rocks bluish gray.